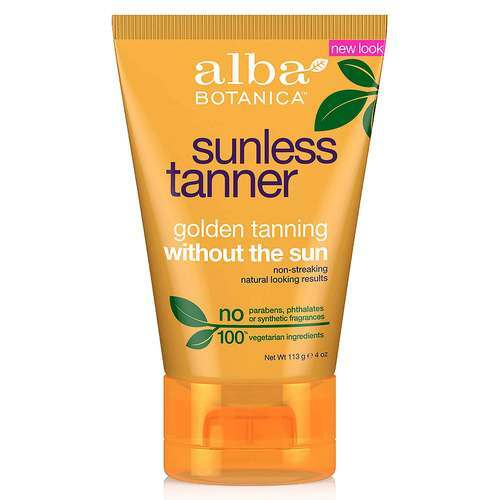 Bronze skin doesn't have to come at the cost of melanoma with Alba Botanica's Sunless Tanning Lotion. Sunless Tanning Lotion goes on fast and turns skin into a golden bronze within three hours of application. Sunless Tanning Lotion dries in as little as 15 minutes and can be reapplied two or three times to reach the desired effect. Just rub Sunless Tanning Lotion over the desired areas of skin and leave the sunscreen, beach towel and tanning oil at home for another day. Sunless Tanning Lotion offers all of the beauty of glowing skin without any of the risks associated with tanning. Order your Sunless Tanning Lotion from eVitamins today and save. Advertências: This product is not a sunscreen and does not protect against sunburn. Repeated exposure of unprotected skin while tanning may increase the risk of skin aging, skin cancer, and other harmful effects to the skin even if you do not burn. Notas: Ingredients: Aqua (Water), Glyceryl Stearate, PEG-100 Stearate, Dihydroxyacetone, Cyclomethicone, Carthamus Tinctorius (Safflower) Seed Oil, Prunus Amygdalus Dulcis (Sweet Almond) Seed Oil, Dimethicone, C12-15 Alkyl Benzoate, Cetearyl Alcohol, Ceteareth-20, Cetyl Alcohol, Erythrulose, Stearic Acid, Glycerin, Butyrospermum Parkii (Shea Butter), Achillea Millefolium Extract, Aloe Barbadensis Leaf Juice, Althea Officinalis Leaf/Root Extract, Angelica Archangelica Root Extract, Betula Alba Bark/Leaf Extract, Calendula Officinalis Flower Extract, Camellia Sinesis Leaf Extract, Chamomilla Recutia (Matricaria) Flower/Root Extract, Echinacea Purpurea Extract, Ginkgo Biloba Leaf Extract, Hydrastis Canadensis (Golden Seal) Extract, Hypericum Perforatum Flower/Leaf/Stem Extract, Lavandula Angustifolia (Lavendar) Extract, Rosa Carina Fruit Extract, Rosmarinus Officinalis (Rosemary) Leaf Extract, Salvia Officinalis (Sage) Extract, Spiraea Ulmaria Flower Extract, Thymus Serpillum Extract, Urtica Dioica (Nettle) Extract, Retinyl Palmitate, Tocopherol, Isopropyl Palmitate, Lactic Acid, Steareth-20, Xanthan Gum, Benzyl Alcohol, Phenoxyethanol, Potassium Sorbate, Fragrance (Parfum). Directions:Apply lotion evenly to clean and, for best results, exfoliated skin. Use sparingly near hairline, knees, ankles and elbows. Avoid eye area. Wash hands with soap and water immediately after application. Allow up to 15 minutes to dry thoroughly. For darker color, wait three hours and reapply. May stain some fabrics. For best results, avoid swimming, bathing or exercising for three hours after application. Alba Botanica Avaliações de Clientes.